The Orange RX9 is back, and it’s more fun, more versatile and basically better than ever. We’re not too keen on pigeonholes, so let’s just say this is the Orange for really taking flight, whether that’s on road, off road or even over your shoulder when you want to go wild. Still built around a responsive but comfy double-butted alloy frame, for 2017 we listened to riders and improved the sizing by shortening the 30.9 seat tube. Meanwhile, a 142 x 12mm bolt-through rear and 15mm bolt-through fork stiffens things up for a sturdier feel and snappier handling. On top of that, the new chainstay disc mount keeps things tidy and accessible for running panniers and mudguards – great for going the distance whatever the weather. Whether you’re razzing around or round-the-world bikepacking, the Orange RX9 is right at home on the tarmac, towpath or tropical dirt roads. Thing is, it’s also built for the rough stuff and loves to prove it: a plucky little hero whose off-road talents are bigger than you think. A bike for adventures. An Orange through and through. The Orange RX9 S is more of an allrounder than the Pro version due to the double chainrings. Still rugged enough not to worry where roads or otherwise may lead. Sunset Cycles offers the 2018 Orange RX9 S road cross bike in Fresh Orange with up to 24 months 0% finance and free delivery. Rider Height Guidance* 5'5" to 5'7" 5'6" to 5'10" 5'9" to 6'1" 6'0" to 6'3" 6'2" to 6'5"
Unless otherwise indicated all measurements are in mm. Bottom bracket height measured from axle. *This is for guidance only. You may be taller or shorter, it doesn't mean our bikes will not fit you. 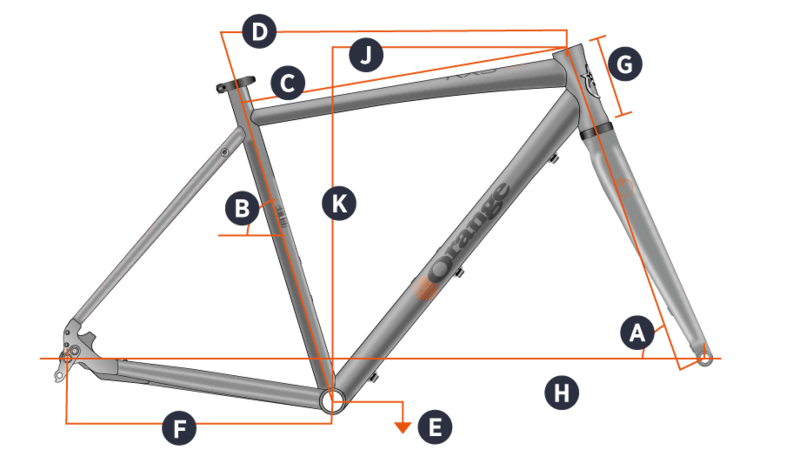 The best way to determine the correct bike size for you is to try one. Please contact us if you are in any doubt about the correct bike size for you.